Total revenue in 2018 for U.S. credit unions grew 12.8% to $74.4 billion, a 3.2-percentage-point acceleration from 2017. Annual income at credit unions has increased 37.4%, or $20.2 billion, since the Great Recession. Largely a result of rising loan demand and interest rate trends, the amount of income generated at credit unions has expanded throughout 2018. Buoyed by interest rate hikes, interest income rose 13.9% year-over-year to $54.7 billion at year-end 2018. Interest income, which consists of income from investments and loans, comprised 73.5% of credit union revenue. The Federal Reserve issued four rate hikes throughout the year, which subsequently pushed up interest rates on both sides of the balance sheet. Gaining more per dollar loaned and invested, credit unions increased loan income (less interest refunded) 13.1% annually to $47.6 billion as of Dec. 31, 2018. Investment income increased 20.3% to $7.1 billion. .
Interest income, which makes up 73.5% of total income at U.S. credit unions, increased 13.9% year-over-year in 2018. Non-interest income, made up primarily of fee income and other operating income, accounted for the remaining 26.5% of credit union revenue. Total non-interest income reached $20.0 billion, a 9.4% bump from year-end 2017. 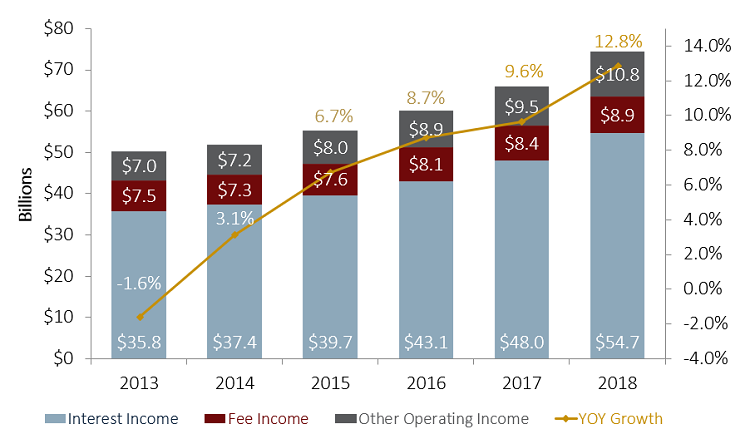 Fee income in 2018 increased 5.7% to $8.9 billion. Other operating income increased at the fastest rate, 14.1%, of any non-interest income component and reached $10.8 billion. Propped up by the NCUSIF rebates, this income component made up 14.6% of total revenue at U.S. credit unions. This is an excerpt from the credit union performance overview available in Callahan’s Credit Union Strategy & Performance. Interested in reading the full piece? Learn how you can get access today. Would suggest the falling rate environment would have the opposite impact, namely falling revenues from lower yields and slower growth. Interesting to note that as rates rise, earnings improve and non-maturity shares rise in value (lower relative cost to agency curve), NEV results deteriorate and the NEV Supervisory Test is causing many CUs to migrate to higher risk categories! The disconnect between earnings at risk and value at risk under the liquidation model (NEV) and the extreme stress test of NEV Sup Test needs to be addressed. Falling rates is the greatest threat to CUs as margins get squeezed and a lower rate environment almost always is accompanied by increased credit risk and option risk. The only good news is that the NEV Supervisory Test results improve despite earnings declining and credit related issues (not factored into liquidation model). Look out below!